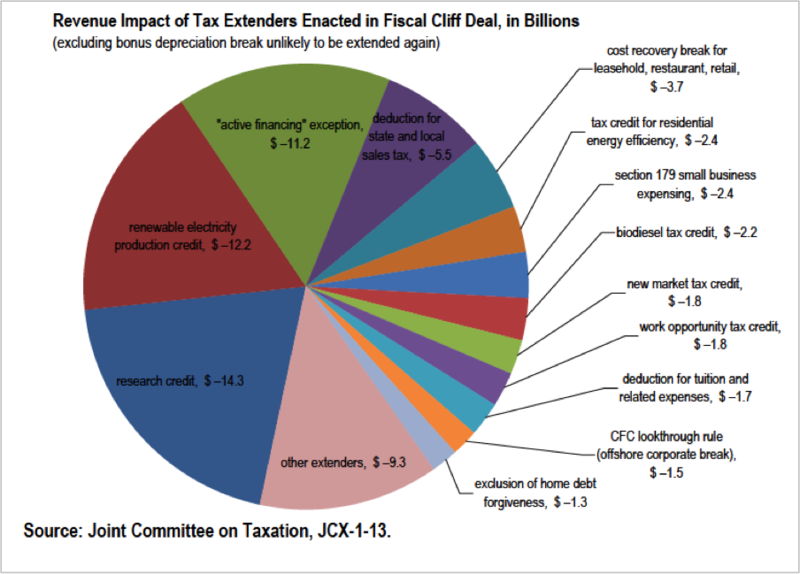 As the next Senate Finance Committee Chairman Sen. Ron Wyden (D-OR) takes the gavel, his first priority will likely be to renew the more than 55 tax breaks or extenders that expired at the end of the year. These provisions are essentially a grab bag of goodies for business and industry, as well as some for individuals. Last year, they cost taxpayers a whopping $74 billion--$63 billion of which solely benefited businesses, according to the Joint Committee on Taxation. One of the most popular—and most expensive-- extenders is the research and development tax credit, which subsidized business expenses at a cost of more than $6 billion in 2013, according to the Tax Foundation. Some other popular provisions include bonus depreciation, the mortgage deduction and incentives for the renewable energy industry, as well as an $11 billion break for U.S. multinational corporations that allows them to defer U.S. taxes on overseas income. These measures are separate from popular tax breaks like the mortgage deduction, the earned income tax credit and exclusions for employer health insurance. There are also the more obscure, smaller extenders like the tax break allowing filmmakers to deduct up to $15 million on movies produced mostly in the U.S. and another for building NASCAR racetracks. Congress renews these temporary tax measures on an annual basis, but they were left to expire last year as lawmakers refocused their efforts on restructuring the sprawling tax code. Like other major plans on the Congressional to-do list, tax reform will get kicked down the road again – clearing the way for action on the extenders. Senate Majority Leader Harry Reid introduced a clean extenders bill late last year, which would extend all expiring provisions for one year. Of course, since all of the provisions have expired, they would be made retroactive. “I talked to Wyden today and he’s going to focus on that as soon as he gets the job,” Reid told Roll Call earlier this month. While Democrats in the Finance committee are pushing an urgent renewal of the extenders, Republicans are discussing whether to allow some of the provisions to expire, while keeping others. Hatch did not mention which extenders he would do away with, however; legislation he co-sponsored with Baucus last year would have preserved the deduction for donating a property easement for conservation projects, which has been estimated to cost about $761 million over 10 years. The R&D tax credit is designed to encourage businesses to perform research that benefits society. However, critics of the costly tax credit say the subsidies aren’t always used as intended. According to Citizens for Tax Justice, some companies have used the subsidies to redesign food packaging and other activities that taxpayers would likely not want to subsidize. Bonus depreciation allows businesses to deduct the cost of capital equipment in the year of its purchase. This provision accounts for nearly one-tenth of the bill’s cost, according to the Committee for a Responsible Federal Budget. This credit encourages companies and individuals to use wind and other renewable sources by subsidizing 2.3 cents per kilowatt for electricity generated from wind turbines. This exemption allows companies to defer U.S. taxes on overseas income. Advocates say it helps level the playing field with foreign competitors, while critics say it encourages more U.S. multinational corporations to harbor money offshore. Citizens for Tax Justice says it also allows multinational corporations to avoid tax on their worldwide income by creating captive foreign financing and insurance subsidiaries.” CTJ says the exemption is one of the reasons that allowed General Electric to pay a 1.8 percent effective U.S. federal income tax rate over 10 years. Under this exemption, firms are allowed to deduct their business expenses each year. Capital expenses, which are expenditures to acquire assets that generate income over a period of time, must be deducted over a number of years to reflect its ongoing use. This exemption allows firms to deduct the entire cost of a purchase by up to $500,000 on certain capital investments like equipment. Advocates of this tax break say it’s more geared to small business investment than any of the other tax breaks that claim to benefit smaller firms.